After we got the kids to bed, we played “RegenWormen” (also known as Pick-Omino) twice while we ate dinner. It felt like it was a weird day because I missed out on spending time with the kids. I did help them finish up their dinner and then we sang our normal 3 hymns and read the “Bible book,” but it still was a weird day and I didn’t feel like I got much done. Today I only had contractions early in the day when I was sitting with my legs up in the recliner. The contractions went on over a period of about 30 minutes or so, but when I got up to eat lunch, they went away and I didn’t have any other contractions for the rest of the day or the next…or the next…or the next. I only felt a few Braxton Hicks but nothing that was the real thing. We took our normal family morning walk with the double stroller from about 6:30-8:00 AM. Then we went to the store around 9:30 a.m. to get some groceries. Out for a walk with the kiddos. Since I was at 41 weeks pregnant, I thought that it would be a good idea to try and take a nap. I read a little bit of Baby Whisperer by Tracy Hogg and felt my eyes wanting to close. I fell asleep from about 4:30-6:45 PM. Right before I fell asleep I heard daddy play a scripture song on his computer to the kids. When I woke up, daddy was already sitting at the table with the hymn book singing various Christmas songs to the kids while they ate dinner. I sang a little with them and then daddy read the Bible book. Then Hudson (who just turned 3 years old), and daddy acted out a Bible story. Here I am with my belly about one week before the birth! So now here I am at 4:45 AM on Saturday morning and I’m having real contractions (Not the bout of false contractions I had a little over a week ago!!!) I can’t even begin to describe right now just how excited I am to meet my sweet, precious, bladder-punching-almost-every-time-I-pee third child!!! Also, it is sooooooo suspenseful because I have no idea if it is a boy or a girl. I got out of bed at 3:30 a.m. when I decided that these contractions I had been feeling were not going away and this was the real deal!!! Also, I had been tossing and turning for about an hour or more (since about 2:30 a.m.). 5:10 AM-I woke Michael up about 5 minutes ago. I told him that I am in labor and that he needed to stay up. According to the contraction counter on my iPhone, my contractions seem to be about 2-3 minutes apart and lasting 45 seconds. Michael wants me to give Hannah a call, even though I haven’t lost my mucus plug yet and I feel like contractions are tolerable (I am having a contraction while writing right now). 5:25 AM- I called Hannah!!! I was feeling totally fine when I talked to her, but knew my contractions were around 2 minutes or less apart. I told her that my contractions are about 2 minutes apart and lasting about a minute. I explained to her that my contractions quickly went from 5 minutes apart to 3 minutes apart between 3:45-4:35 AM while I was sitting in the recliner. While I was talking to her I had a contraction and let her know “I’m having a contraction right now, but it feels very tolerable, but they are about 2 minutes apart so do you think it’s time for you to come now? Hannah said that she’d get here in an hour or just over an hour! After I finished talking to Hannah and was going to hop in the shower, Michael asked me if I needed anything and I believe I told him that no I was fine and really felt great and that everything was very tolerable but that I wanted to take a shower before the birth. So before getting into the shower I could converse with Michael with no problem…but I must have made a lot of labor progress while in the shower because when I got out, I could no longer talk to Michael during contractions like I could right before I got in the shower…maybe a half an hour prior. I felt fine during the shower, brushing out my hair is really the main thing I do in the shower and is what determines how long it takes. Anyways, I remember that I had regular contractions in the shower, but I kept just trying to ignore them to preserve my energy for labor and because ignoring them seemed to make the most sense to keep things more tolerable. 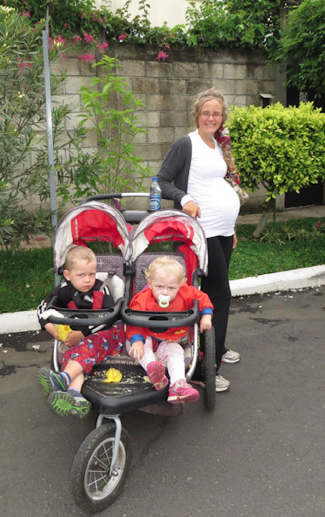 6:39 AM-I had been circling the couch while the kids and Juana were still in the apartment and Juana had been getting the kids ready to go outside on a stroller walk so that they wouldn’t be in the apartment for the birth. Hudson kept on telling me to, “Stop doing that” when I would circle the couch, but I told him that I needed to. Of course he didn’t understand what was going on with his mommies body and I didn’t want to explain it to him because of how young he is. All of a sudden while I was standing in the living room in front of the couch, my water broke!!! I didn’t know what was going on then, but after the birth Hannah told me that the amniotic fluid had meconium in it which can be a sign of fetal stress. I think it was better at the time that I didn’t know that because that may have worried me and added more stress. Michael was already outside with Hudson meeting Hannah in the street as she had just arrived. Juana, our house helper and friend, ran out and told them what had happened. 6:40 AM-Hannah and 2 birth assistants walked into the house just about a minute after my water broke. Michael came back up with them and left the two kids with Juana so that she could quickly get them in the stroller and take them for a walk. That very morning Michael thought about having Juana take the kids on a walk while I had the baby and I thought that it was a brilliant idea!!! I remember feeling very stressed and anxious when they arrived, partly because my water just broke, also because I had been by myself and felt like I needed direction on what to do and where to do it. I remember standing in front of the bed when the midwife walked in the house. In my mind she was moving too slow and needed to say something to direct me right away. She just calmly came in and put some gloves on and was trying to assess and take in the whole situation as I obviously hadn’t given her enough time beforehand to get there and calmly set things up. Anyways, I remember saying to them, “My water broke, what do I do? What do I do?” Hannah basically just said well, we are going to check the baby’s heart rate with a doppler first so you can lay down on the bed and so I did and she checked the heart rate before and after my contraction while I laid towards the end of the bed. The heart rate was 80 bpm then recovery to 130 bpm, then the heart rate was 40 with no rebound. Things all happened so quickly and Hannah had barely gotten a chance to really know a pattern for the heart rate, but with the quick information that she did have, she quickly had Jula set up the oxygen. I believe it was before she had checked the heart rate that Hannah had me push during contractions while on the bed to see if there was any progress, also because we reminded her that I had torn with my last birth while I had given birth squatting. But it felt like my pushing was completely ineffective while laying down. After Hannah got a scare with the heart rate reading, she said that we needed to get the baby out and that I should push while squatting. 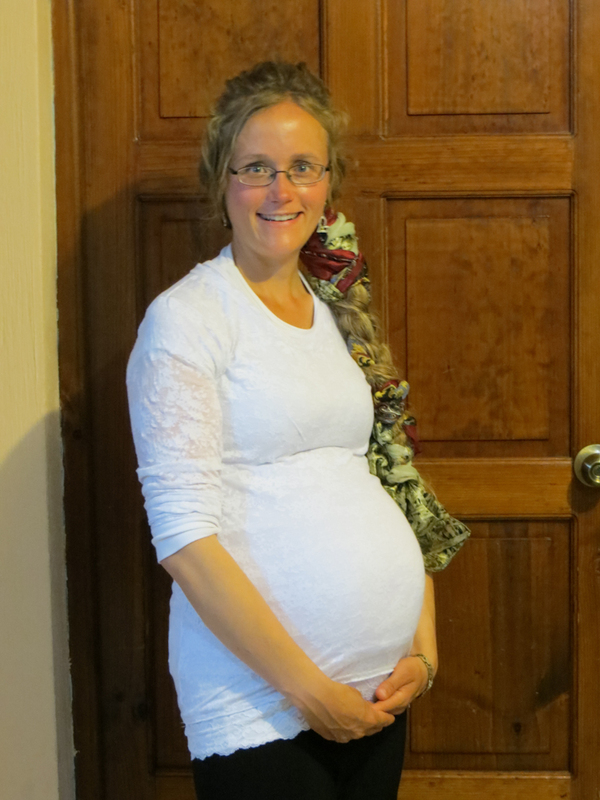 I pushed maybe once or twice with the midwife pulling some and immediately after that the baby was born! I must say that I was quite relieved that the baby was born so quickly after the heart rate situation, which I believe might have not been anything alarming at all because she was very alert and a good color when she came out, but Hannah later told me that sometimes things don’t look good on the Doppler and the baby come out completely healthy while other times the Doppler looks great and the baby come out kind of limp like. 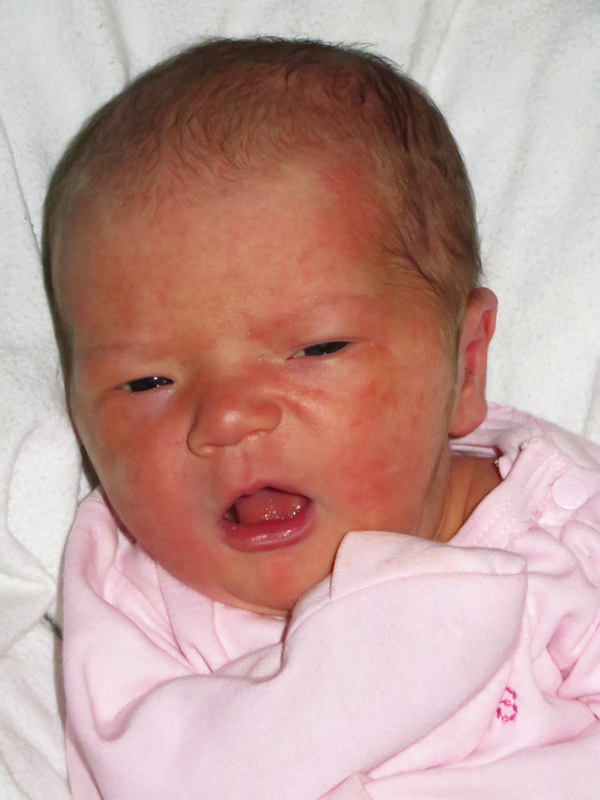 From when Hannah arrived to the birth of the baby it was just about 6 minutes! Once real labor began, the total duration from start to finish was only about 4 and a half hours!!! I think this may have been so quick because I had had false labor a week prior and my body had been getting ready and also because I had exercised daily by bringing the kids out every morning and taking them for an hour or so walk. I was too weak and/or worked up at the moment to check to see if the sweet little baby that I was holding was a boy or a girl and I asked Hannah to tell me and she just said that I could look and find out when I was ready. After a short while I had enough energy and when I looked down, I saw that our wonderful Lord and Savior Jesus Christ had blessed me with a sweet little girl…My beautiful Israela Victoria!!! Meeting Israela for the first time. 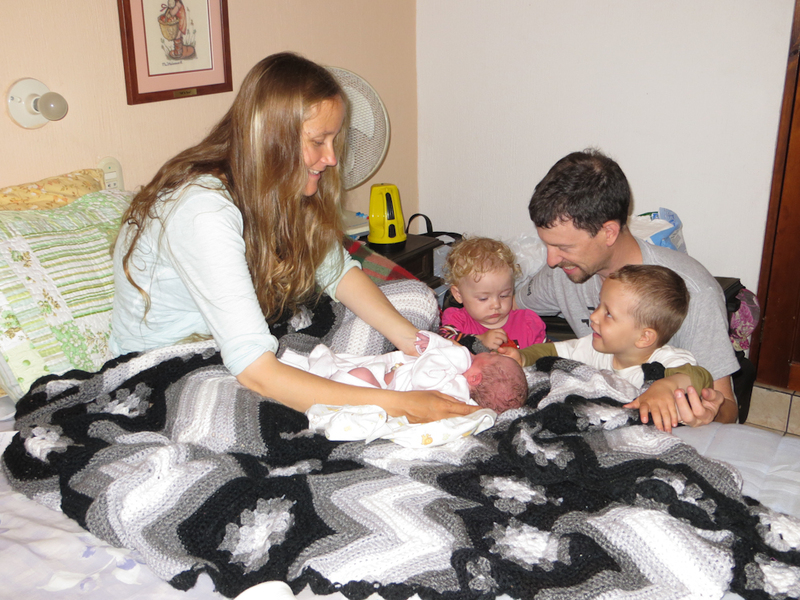 It was so fun to have Hudson and Jubi come in the room and meet their little sister for the first time just a little while later!!! 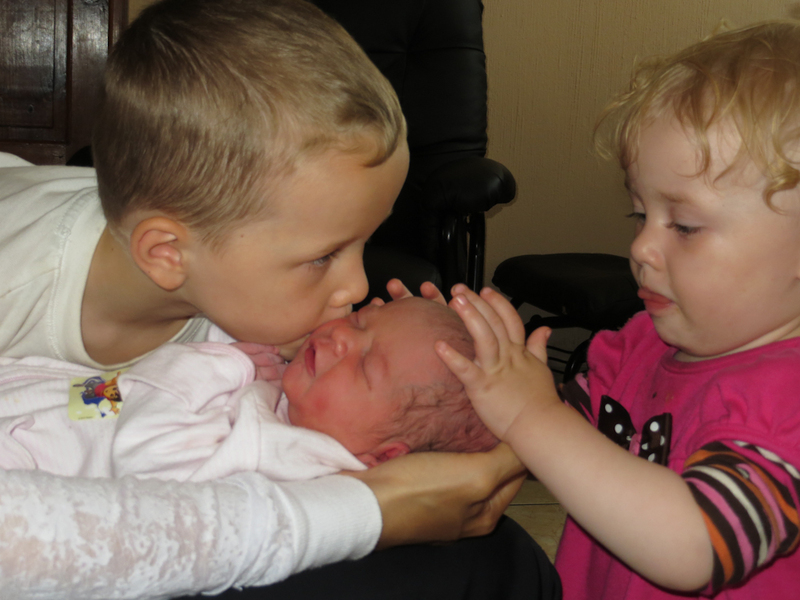 Michael prayed a blessing over Israela and we introduced her to the rest of the family! Hudson and Jubi were quick to share kisses and their toys with her even though she wasn’t quite ready for all that attention! This entry was posted in Babies, Mission Mom and tagged pregnancy by michaelshead. Bookmark the permalink.